Strip it down. That was the inspiration Indian Motorcycle used when developing the latest model in its iconic Scout lineup, the new Indian Scout Bobber. A low slung, blacked-out, minimalist motorcycle that proves less is definitely more. The new muscular Scout represents a core passion of motorcyclists - connecting to the road without a need for anything unnecessary. It's a tangible means of escape from a life that is so easily bogged down by commitments and a boatload of unnecessary "stuff." 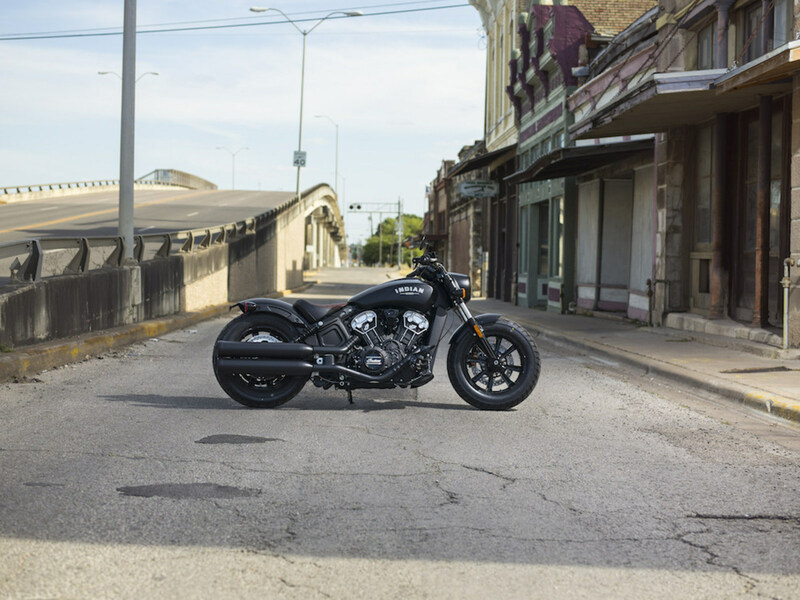 "The Scout Bobber is our most raw and mean machine to date, and the ultimate in the celebration of what motorcycling is about – a powerful engine, two wheels, and no plans of where to go," said Reid Wilson, Marketing Director – Indian Motorcycle. "It's an incredibly fun motorcycle that delivers a ton of attitude, along with a ton of power." The newest member of the Scout family pays homage to the mean, stripped-down builds of America's post-war past. With its tracker handlebars and pegs moved 1.5" closer to the rider, the Scout Bobber delivers a more aggressive riding position so the rider can tear through the urban streets with ease. Its knobby tires and blacked-out wheels keep the rider grounded, while a low-slung profile and 1" lowered rear suspension deliver unfiltered feedback from every inch of blacktop. Chopped fenders front and rear and a new two-tone genuine leather bobber seat enhance the minimalistic styling. New rear LED lights with integrated stop, turn, and tail signals keep unnecessary parts to a minimum. Add the Scout Bobber's raw styling to an American V-Twin engine with 100 horsepower and this motorcycle quickly becomes more of a tool than an extravagance, enabling the rider to fully embrace the thrill of twisting the throttle and enjoying the journey rather than the destination. Learn more about Indian Motorcycle and the Scout Bobber by visiting IndianMotorcycle.com and Facebook, Twitter and Instagram social media channels. Indian Motorcycle is America's First Motorcycle Company®. Founded in 1901, Indian Motorcycle has won the hearts of motorcyclists around the world and earned distinction as one of America's most legendary and iconic brands through unrivaled racing dominance, engineering prowess and countless innovations and industry firsts. Today that heritage and passion is reignited under new brand stewardship. To learn more, please visit www.indianmotorcycle.com.